Eye infections and injuries should always be regarded as emergencies and treated accordingly. These problems can swiftly worsen and even cause blindness, warns Dr Mac. 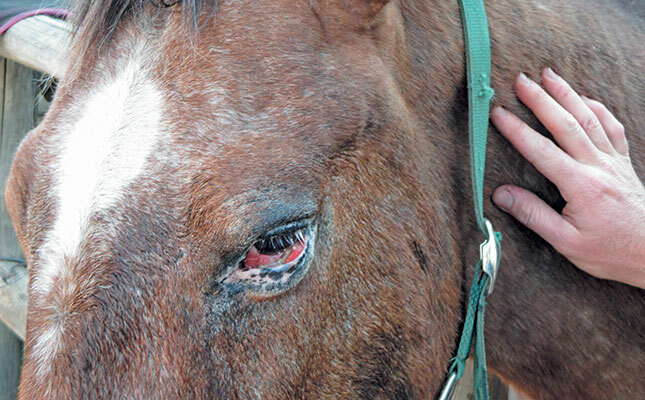 Lack of pigment in the eyelids of this horse caused tearing, which in turn attracted flies, resulting in infection. The healthy equine eye should be clear, moist and bright, with pale pink membranes and only a small teardrop in each inside corner. Both eyes should be open to the same extent and the pupils should be the same size. Signs of eye problems include excessive tearing, pus or blood, a blueish-white film over the eye, reddened membranes, or swollen eyelids. Any eye infection or injury can rapidly escalate and cause permanent blindness, so even mild signs should not be ignored. Mild eye infections, or conjunctivitis, are common in spring due to wind, dust and flies; in winter, such infections are more often due to microbial respiratory diseases such as strangles (equine distemper) or chlamydia. A horse’s eyes are particularly prone to physical injury, either from foreign bodies such as thorns or grass awns, or due to impact from a kick, bite or running into a wire fence. Sometimes, several different causes escalate the level of damage to the eye in a vicious cycle. For example, horses with unpigmented eyelids are highly susceptible to sunburn, leading to red and swollen eyelids and severe tearing. 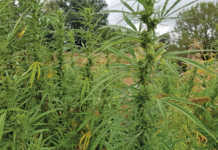 This attracts biting flies, which cause further damage and infection. The eye becomes painful, the tears become purulent (emitting pus) and the horse starts rubbing its eyes against a tree or stable door, causing yet more inflammation. This kind of cycle can also be initiated by an irritant chemical such as soap or dip, or dust on a windy day. 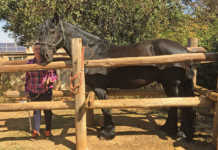 African horse sickness can cause extremely swollen lids, and the membranes can become dark red or start bleeding. The same symptoms will be produced when a cobra spits venom into a horse’s eyes, but the eyes will be more painful in this case. Treat minor tearing with a saline solution made by mixing a level teaspoon of salt in a cup of cool, boiled water. The solution can be kept in the fridge. Soak cotton-wool cosmetic removal pads in the solution and wipe both eyes clean three or four times a day for about four days. Wipe the area around the eyes as well. You can also rub on some Vaseline to help decrease the skin irritation. Place a fly mask on the horse immediately afterwards to prevent the tear from attracting biting flies. The entire stable can be affected by an outbreak of conjunctivitis when the flies start hatching in early summer. A fly control strategy should be instituted immediately. If a chemical or cobra venom is present in an eye, use a hosepipe to run plenty of water over the horse’s head and keep flushing the eyes for about 10 minutes. Call a vet, as cortisone and anti-inflammatory medications will be needed. Biting flies produce brown stomach worms that can cause summer sores around the eyelids. 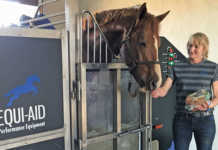 These can be treated by administering a dewormer containing moxydectin to all the horses in the stable. Any wounds or punctures to the eye or eyelids should be regarded as emergencies as they usually require general anaesthesia and surgical intervention.